This will be followed on Sun April 17 byChristine Venner-Westaway and Friends with their Joan Baez tribute show. 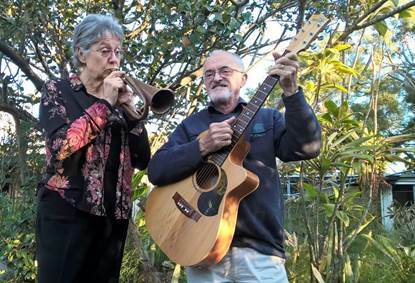 Local musicians The Karen Law Band (with Jenny Fitz) are playing on Sunday, 15th May, while Brisbane duo Rebecca Wright and Donald McKay are coming on Sunday 7th August. The Delphics (Don Jarmey, Sam Krauser and Sally Harris) are due in October (date to be confirmed) and Irish songwriter Kieran Halpin will be here in December.